Manok Pansuh or Ayam Pansuh is probably the best known and loved chicken delicacy in Sarawak. 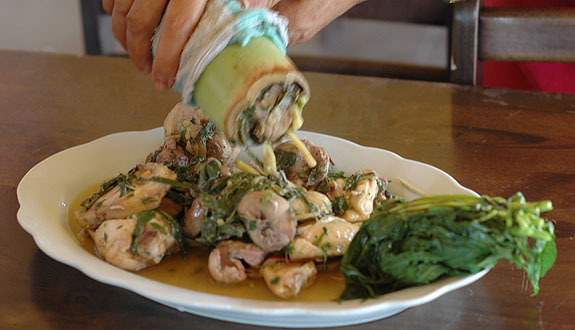 Cut chicken pieces, mushrooms, lemongrass and tapioca leaves are stuffed into a bamboo cylinder and cooked over an open fire. This natural cooking method seals in the flavors and produces an astonishingly tender and juicy chicken with a gravy perfumed with lemongrass and bamboo. Apparently pansuh is originally Iban word and the dish is most commonly prepared during festive occasions such as Hari Gawai. 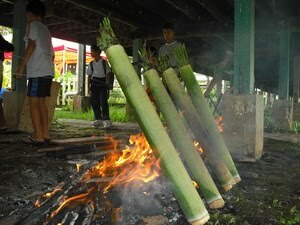 The uniqueness of using the bamboo stem to cook is that the bamboo imparts a special aroma and texture to the food which is impossible to achieve using other cooking methods. By employing this method of cooking, free range locally bred chicken which normally has a chewy texture will tenderize under the steam pressure that accumulates and circulates within the bamboo. For us city slickers where the luxury of cooking on an open fire and with bamboo is out of question, one can still try to emulate the taste, aroma and texture of the traditionally prepared ayam pansuh by cheating and using a conventional slow cooker or cooking in a heavy bottomed pot under low heat for a longer duration. Whatever method you employ, the trick is to cook the chicken with a minimal amount of water without it getting burned in the process. With some help from our friends at the Tribal Stove Restaurant in Kuching, Sarawak (more about them here) we will attempt to describe how to prepare the traditional ayam pansuh. You will need a lemang bamboo, a whole chicken, bunga kantan, pounded garlic, lemongrass and shallots, diced turmeric leaves, salt, preferably organic Bario Highland Salt and a banana leaf. Despite the deceptively simple ingredients, you’ll be amazed at the final results. First things first. Before using the bamboo, fill it with water for half an hour to an hour to clean the inside, and encourage the water to seep in. Then slightly char the chicken over a fire to enhance the yum factor. You can have it cooked through if you prefer. While waiting for that, you can dice the bunga kantan into small pieces. Once the chicken is done to your preference, dice it up into desirable pieces. Mix all the other ingredients together and marinate the chicken pieces Empty the water from the bamboo and stuff in the marinated meat. Don't compact all the meat but leave it loose. Ensure that you have some tapioca leaves left to cap the bamboo later on. If you want pansuh soup, add in a cup of water. Capp the bamboo with tapioca leaves and proceed to cook over a pit fire with your bamboo standing at a 60-80 degree angle. Your pansuh is cooked when the water starts to gurgle at the cap. Be careful to take note of the color change on the tapioca leaves to determine if it is cooked. You are now ready to serve your own home cooked ayam pansuh by transferring the fragrant juicy and tender meat onto a plate. It is best taken with hot plain rice. Enjoy!